When you’re running a YouTube campaign, direct conversions are an icing-on-the-cake scenario. Often, the people who have seen your YouTube ad for the first time are newcomers to your brand, and they are probably not going to convert right away. With these expectations in place, we need to look at engagement performance to evaluate the success of our YouTube campaigns. We have metrics like views, view rate, video played to, as well as my favorite: earned metrics. In this article, I’ll go through what earned metrics are, why they’re valuable to YouTube campaign performance, and how you can use them to improve your video campaigns. After a viewer watches your YouTube ad, they might go on to perform other actions that are a part of your YouTube channel. 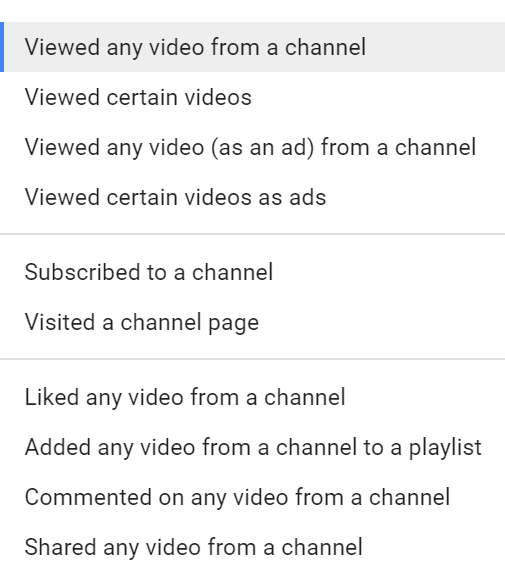 When running any YouTube campaign in Google Ads, I like to look at these additional actions as an indication of how well my videos are engaging users. The best part about all of this? YouTube advertisers do not pay a cent for any of these additional actions, which are officially called earned metrics. Earned views – Total amount of views after watching your initial YouTube ad. The views can be from the same video or any other videos on your YouTube channel. The earned views are incremental too. This means if one user watches five additional videos after seeing your YouTube ad, you’ll earn five earned views. Earned likes – Total amount of likes any of your videos receive from viewers after seeing any of your YouTube ads. Earned shares – Total amount of times viewers of your YouTube ad share any of your videos. Earned subscribers – Total amount of users who subscribed to your YouTube channel after seeing your YouTube ad. Earned playlist additions – Total amount of times your YouTube videos were added to another user’s playlist after seeing your YouTube ad. Getting your video in front of the right audience is fantastic. Getting people from the right audience to act is even better. Once you start seeing the data on which videos are engaging your users the most, you can choose to adjust the bids on the winning video ad. You could also possibly look at expanding upon the targeting that’s already working. In the new Google Ads interface, we cannot add earned metrics columns at the placement, topic, audience or demographic level. (Boo.) But if you’re like me, and like to create super-specific ad groups based of the video targets, you can still get a good idea of which targets get the most earned metrics. Use this view to try and find more ways you can expand upon what’s working to grow your YouTube ad campaigns. How Else Can We Use Earned Metrics? Why, with remarketing of course! Assuming you already have your YouTube channel linked with your Google Ads account, you can create several remarketing audiences based off of user interactions with your organic videos or your paid video campaigns. And if you haven’t guessed where this is going already, yes, we can create remarketing audiences off of the earned metrics…kind of. Okay, so we can’t directly remarket from just earned metrics from our YouTube ads, but we can create audiences off of the main components. You can see in the image above that we can remarket to video views, video likes, video subscribers, playlist additions, and shares. So if our original campaigns are doing their job of engaging users to take some action on our channels, we can work on next-step marketing campaigns with audiences built with the help of our earned metrics. If we’re using YouTube to reach a new audience, first-time viewers likely aren’t going to be ready to convert right away, but that doesn’t mean you’re not getting value from your campaigns. Stay on top of user engagement with your videos. Earned metrics will give you a better understanding of how recent viewers of your YouTube ads are interacting with your channel and boosting your brand affinity. Plus, it’s always fun to report to clients on all the free additional actions we’re gaining from our efforts. Biz Tips: Why should I use YouTube cards and end screens in my video?